The question everyone asks when they hear I’m doing the Camino — is why? Great question — but I don’t have a great answer — all I can say is that it called out to me. But, when people were asking me this question the “Camino” kept popping up. Literally. Every few days I heard or saw some mention of it. 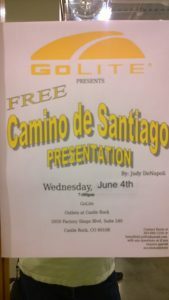 Crazy things, like I was shopping at a nearby outlet mall and right as I walked by a store a guy was hanging up a sign advertising a Camino talk. After a couple of weeks of this — I got the message — and decided to “check it out.” I went to the above presentation and thought it sounded interesting. The speaker mentioned a group called American Pilgrims on the Camino which just happened to have a Colorado Chapter so I checked them out. The chapter turned out to be a fantastic resource that offered monthly hikes with incredible people who had already done the Camino and were very welcoming and happy to share their experiences and offer tips on how to do it yourself. I enjoyed each gathering and slowly but surely I kept moving toward doing the Camino. I got a backpack for my birthday. Bought my ticket to Madrid just after the holidays and now am packed and ready to go.